I have had 5 people cancel on me this week. A few were “important” meetings for work that I had to re-arrange my schedule for because they were ‘SO IMPORTANT’ and others were informal catch-ups with friends. Am I annoyed? Not really. I very often am the flake who forgets about an appointment or has to cancel a lunch date, it happens. Additionally, I have the tendency to get a little too enthusiastic about scheduling and end up having to slim things down if it has been a crazy week, so I get it. I give people grace because I hope they would give it to me. But it got me thinking about how much I have evolved over the years with scheduling and planning things, and MAN have I evolved. I rarely re-arrange anything for anybody anymore, and this week was a good reminder as to why. When you get in the habit of moving around your priorities to meet others’ needs, you will suffer. Guaranteed. A couple of these work meetings I had scheduled were in the early morning and a far drive away- which means I would have had to skip my morning workout AND not be able to have breakfast with my daughters. NOPE. Am I more selfish now? Hell yes. I know very well what I need in my day to day life to feel balanced, happy and productive. If I do not get what I need and I run myself ragged, I am not a good Mom, I am not a good wife, I am not a good employee. Period. If I want to give LIFE my best, I have to guard my priorities and my schedule and do what works for ME to be my best in all my roles. I remember early in my career when people wouldn’t give me reasons they couldn’t do things, work on projects or set up a meeting etc. and I remember thinking those particular people must be slackers. At that time in my life, I booked myself solid in all departments of my life, especially work. I would schedule anything with anybody at anytime! I am flexible! I am committed! I am dedicated! I will get the job done and THEN SOME! You know what I was? Naive. Because who was the first to suffer? Me. My work suffered. My health suffered. I skipped lunches, forgot to eat. Got to work too early, stayed too late. Yet…was NOT productive OR effective at ALL, yet I considered myself a hard worker because I was always doing SOMETHING. What a joke. And then I caught on. Ah yes, I am the keeper of MY schedule and my work load. 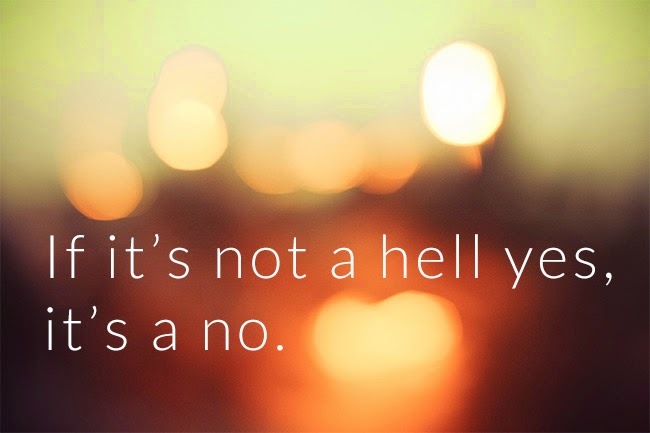 When I finally figured that out, I became more productive and better at my job, I learn to say no to things I did not need to do or that were not important, because I only have so many hours in the day. I learned to time block tasks and push away all other distractions. I learned that I didn’t have to respond to an email or a phone call or a co-worker’s need IMMEDIATELY. Especially if I was working on a project that needed my full attention. We unfortunately live in a society in which we are supposed to jump whenever somebody wants something from us. Text back immediately. Respond immediately. Get that project done in 1 hour. There is this general assumption out there that this is just how business needs to be done if you want to be successful, keep clients, be looked at as a hard worker. NO. We are not doing anybody any good by teaching others that they can have whatever they want from us when they want. If you want a quality response, quality work or better yet, if you want to retain me as an employee and get GOOD work out of me, you will give me time and respect my time. This goes for friendships and family relationships too. Here is a prime example. In my current role, I work with a lot of needy and difficult parents who will literally call me 10 times a day and everything is an emergency (it is not). During the winter months, I spend a lot of time reading college applications and it takes a lot of focus. I have my schedule mapped out so that two days a week in the morning, that is my sole focus and nothing else. I don’t take phone calls or check emails until after lunch, and I typically can get back to everybody who has reached out within that day without issue, but those specific mornings are blocked off without exception. There was one particular Mom who was calling and calling one morning, but I did not answer as it was my blocked out application reading time. She left me 4 messages, emailed me, texted me and called my boss all in a matter of 2 hours. When I finally got back to her that day, she lit me up. She was beyond frustrated because she was filling out her son’s college application and a question confused her and ‘she just wanted to get this done and off her to do list for today’ (why yes, parents fill out college applications for their kids now in case you were wondering and yes it is absolutely ridiculous). After she was done yelling at me for taking 2 hours to get back to her- I calmly said to her…. “I am sorry you are frustrated, but this morning I was focused on reading applications which I take very seriously. I would hope that when it is time for me to read your son’s application you would want me to give it the same focus and attention”. She got real quiet and then immediately changed her tone to that of condescending to practically brow-nosing. Eye roll. I have to use that line on a weekly basis. WEEKLY. Because again, I know better. I know you can teach people how to treat you and what you will or will not allow. I know that answering every single phone call every minute means I will get nothing done and feel stressed and have to work longer hours and a result not being my best self. And if I do not guard my schedule and my priorities for my day for both work and personal life- people will walk all over them, most of the time un-intentionally. I am not sorry for it, I am better for it. I challenge you to find what your personal equation is for your own balance within work and personal life. Do you need a slow morning start? Do you need an hour to decompress at the end of your work day and plan ahead/reflect/organize? Do you need space and time to create new ideas? Do you need a workout every morning? Meditation? Do you love going to your Saturday morning spin class? Sunday Church? Own those priorities and protect them with your life because it IS your life you will lose if you do not. Lastly, please do not be sorry for it. People WILL be annoyed, but don’t be offended or worried about that. They are only annoyed because they typically are the people who are running themselves ragged and are not brave enough to guard their own life, so they are envious. I know, I used to be one of them.